After establish a core of blues and some khaki, don’t forget that this scarf easily supports some accent touches of shades of red! 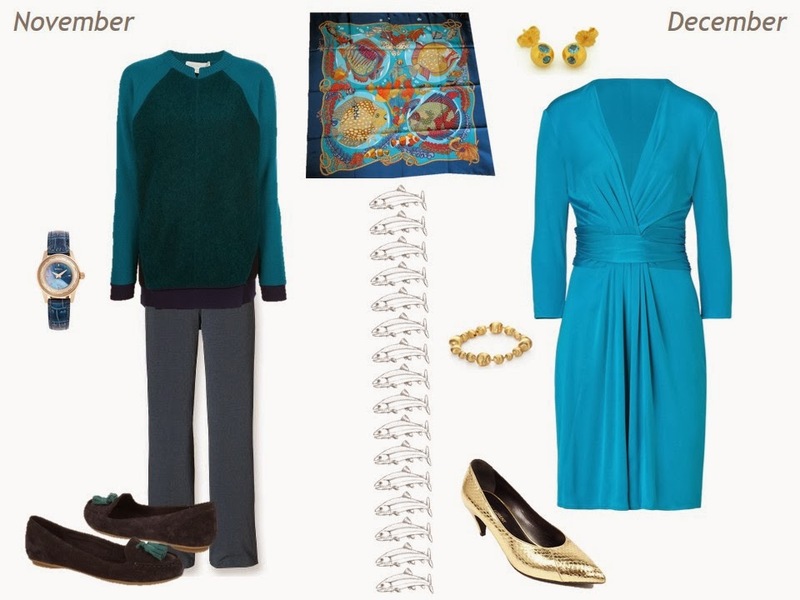 And as usual, at the end of the year, you have a closet full of consistent sleeveless tunic tops, draped dresses, and some unusual shades of blue – which is in total a coherent and very versatile wardrobe! This could a new serie: From a scarf to a whole wardrobe!!! I am speechless with admiration! Elizabeth. Waiting for this installment was the well worth the wait. Absolutely love the versatility of so many blues in combination. The navy ankle booties? Love. Love! LOVE! It is sooo very difficult for me to find stylish navy shoes. Oopsie, my size is sold out 🙁 I must take it as a sign that I don't truly need another pair of shoes at the moment and will continue to wear what I have until a true need arises. Thanks for the extreme pleasure you give to me and others reading here as we learn many different lessons. I just wish I had learned this 30, 20, or even 10 years ago. Better now than never, right? Nice wardrobe! I was expecting you to pick some items to go with the contrasting oranges and red in this scarf, what is your thought process when you decide or against picking up on the secondary colors? There's definitely a lot of potential to include touches of red or orange in a wardrobe based on this scarf – I didn't really decide AGAINST doing that as much as I found myself really enjoying working with shades of blue. The red stripe on the sweater, and the garnet earrings, were a small sample of what might be possible in this vein. I would love to see a hybrid approach using a color palette and combining a season and environment with various types of activities. Example: Color palette: Black, gray, white and red. Season: Winter in the Upper Mid-West. Environment: Urban. Work: Municipal finance (Formal and informal days), Exercise: walking and gym, Home: Condo – entertaining with small dinners at home, and Recreation: Concerts, museum and with three formal fundraisers. All of these considerations taken together! 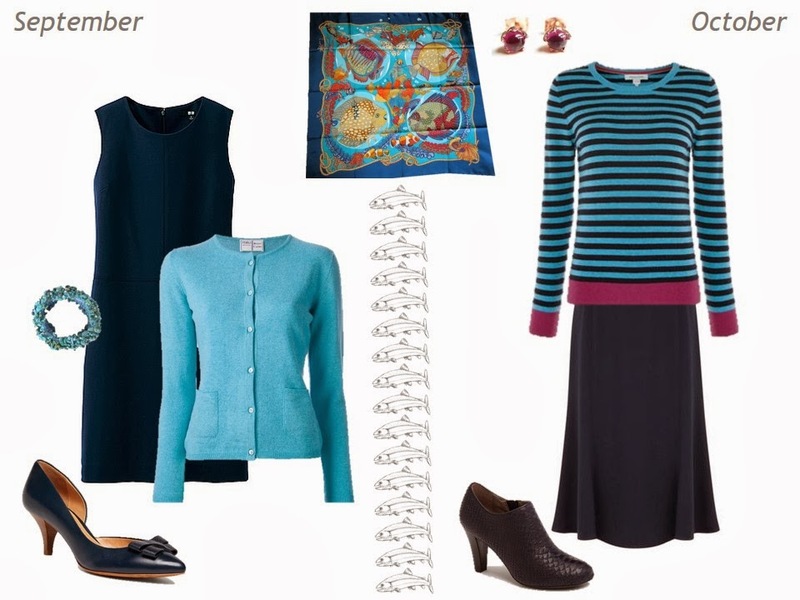 Creating different ideal outfits that are then combined for the seasonal wardrobe. (This example seems to be close to your life, and in many ways, the sharing of your wardrobe choices on a daily basis was close to this idea. But it would be interesting for see you approach it with a slightly different mix of elements that you have already been using. ) Another example: Color Palette: Olive, Tan, Ivory and Coral. Season: Spring in the Southwest. Environment: Suburban. Work: Nurse. Exercise: Soft ball, golf, hiking and biking. Recreation: Las Vegas for long weekend three or four times a year: Home: Detached house with a pool. Oops, I did not quite finish my thought. I am interested more in the analysis of the planning for specific wardrobes with a variety of constraints and needs. (We will keep money and physical shapes out of the discussion!) You are very analytical and very tactical, and that is why I am so fascinated by your blog. Yes! I agree with Susan above – the tactics and analysis in your posts are what keep me coming here day after day. Thank you so much for sharing your work with us all. I love anything blue but this is a somewhat more focused approach than mine, which was buying anything in blue and hoping I would end up being able to coordinate some sort of an ensemble! Also taupe has been a staple for me but I hadn't thought of khaki, which does look good. 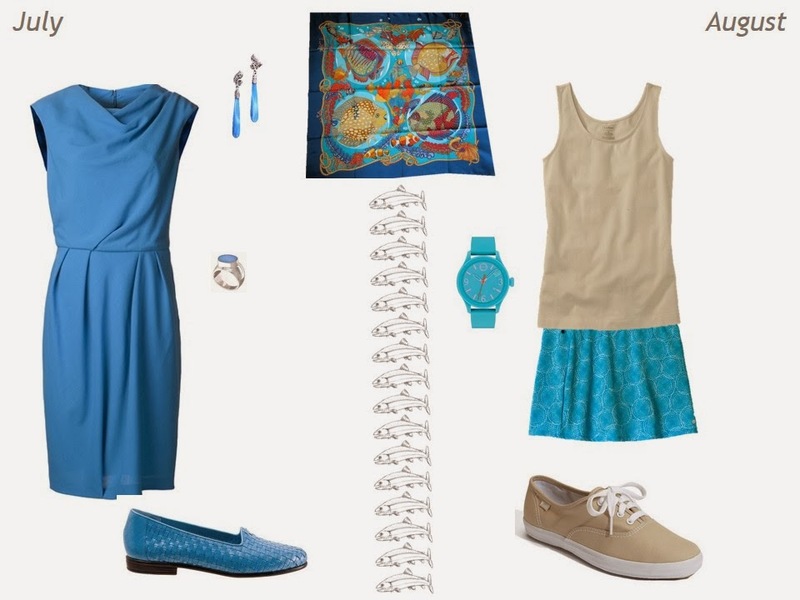 Previously you combined navy and turquoise as basic colours, which I found inspirational. What I really like from your posts is that they show how to have a coordinated wardrobe which does not rely on too much black. I love black and it is so slimming but there are so many times that black is not suitable – weekend mornings, the beach, bbq at someone's place etc. Another consequence of your blog is that I'm now wearing dresses. I thought I was, frankly, too fat for dresses as mostly you see fitted dresses with lots of lycra but you show dresses with unusual shapes now I'm experimenting. Off to a wedding in Bali tomorrow and it will be too hot for many clothes so for the beachside pre-wedding drinks I will debut a linen dress with very simple sandals and bag. This would have terrified me before reading your blog as I relied on only tailored clothes but you've shown how important the overall line is. So many, many thanks.